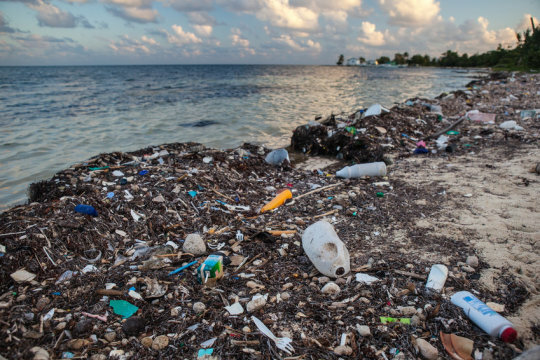 Scientists have engineered an enzyme which can digest some of our most commonly polluting plastics, providing a potential solution to one of the world&apos;s biggest environmental problems. The research was led by teams at the University of Portsmouth and the US Department of Energy&apos;s National Renewable Energy Laboratory (NREL) and is published in Proceedings of the National Academy of Sciences (PNAS). Professor John McGeehan at the University of Portsmouth and Dr Gregg Beckham at NREL solved the crystal structure of PETase -- a recently discovered enzyme that digests PET -- and used this 3D information to understand how it works. During this study, they inadvertently engineered an enzyme that is even better at degrading the plastic than the one that evolved in nature. "We can all play a significant part in dealing with the plastic problem, but the scientific community who ultimately created these &apos;wonder-materials&apos;, must now use all the technology at their disposal to develop real solutions." With help from the computational modeling scientists at the University of South Florida and the University of Campinas in Brazil, the team discovered that PETase looks very similar to a cutinase, but it has some unusual features including a more open active site, able to accommodate human-made rather than natural polymers. These differences indicated that PETase may have evolved in a PET-containing environment to enable the enzyme to degrade PET. To test that hypothesis, the researchers mutated the PETase active site to make it more like a cutinase. And that was when the unexpected happened -- the researchers found that the PETase mutant was better than the natural PETase in degrading PET. Professor McGeehan said: "The engineering process is much the same as for enzymes currently being used in bio-washing detergents and in the manufacture of biofuels -- the technology exists and it&apos;s well within the possibility that in the coming years we will see an industrially viable process to turn PET and potentially other substrates like PEF, PLA, and PBS, back into their original building blocks so that they can be sustainably recycled."